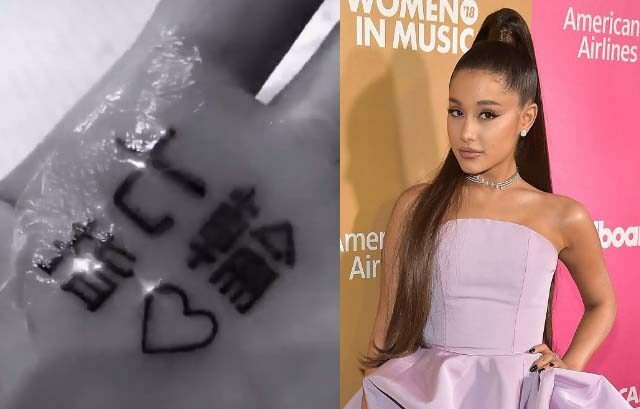 Ariana Grande has attempted to correct a misspelt tattoo on her hand, which was meant to say “7 rings” in Japanese, by adding the kanji for “finger”. A BuzzFeed Japan reporter was quick to point out, however, that the additional kanji character now makes the phrase read, “I hate fax machines”. In Japan, the original fax machine contained 7 cogs (or rings) and hence it was given the nickname “seven rings”. “There was great opposition to the introduction of the ‘seven rings’ in Japan, as it was feared that the technological marvel that is the facsimile would eliminate jobs – workers would subsequently give fax machines the finger on a regular basis,” writes BuzzFeed reporter Yumi Takahara. The fax machine is now considered one of the great wonders of Japan and Grande’s tattoo is highly offensive in Japanese culture.